Who doesn’t love Mad Mike Benson? Who? You tell me and I’ll punch them in the face. This is the first story Mike did for us way back when, and we couldn’t have been happier. Mike’s somewhere in the Caribbean this week, so now we couldn’t be more disappointed in Mike for not inviting us. Screw you Mike, but pleased keep writing stuff for us regardless. 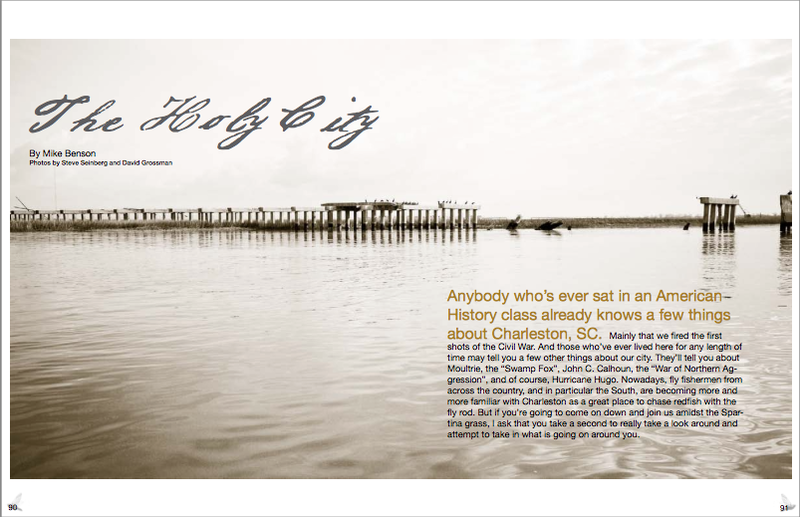 Anybody who’s ever sat in an American History class already knows a few things about Charleston, SC. Mainly that we fired the first shots of the Civil War. And those who’ve ever lived here for any length of time may tell you a few other things about our city. They’ll tell you about Moultrie, the “Swamp Fox”, John C. Calhoun, the “War of Northern Aggression”, and of course, Hurricane Hugo. Nowadays, fly fishermen from across the country, and in particular the South, are becoming more and more familiar with Charleston as a great place to chase redfish with the fly rod. But if you’re going to come on down and join us amidst the Spartina grass, I ask that you take a second to really take a look around and attempt to take in what is going on around you. When you’re poling or wading the flats north of town, just stand still and listen for a minute. If the wind is blowing just right, you may hear the low mournful hum of slaves singing hymns in fields long untended. Running across the harbor, you may hear the sound of Yankee cannons over the whine of your outboard, conducting one of the longest artillery sieges in modern military history. As you leave the harbor and turn north into the waterway, try to picture the Sullivan’s Island bridge completely dismantled and laying on its side in the creek, and the raw natural forces it took to accomplish that. And when you’re standing on one of the “fly away places,” the small cedar islands that escaped slaves used to stop and pray on for God to turn them into birds so they could fly back to Africa, try your hardest to keep your feet on the ground. They call this place the Holy City, and the tour guides in town will tell you it’s because of the sheer number of churches, or our history for religious freedom. But spend enough time being quiet in the backcountry and it’s hard to ignore the natural and spiritual forces that seem to surround this place. So when you come to Charleston to chase the reds, bring your 8wt, a box full of crab and shrimp patterns, and open your mind and your soul. You may just be surprised by what you’ll catch down here.